Will mark it as leo+ for now. Can definitely leo? or - if someone has different view on this. Kevin, do we have any ux spec or user stories of supporting vCard? thanks. > Kevin, do we have any ux spec or user stories of supporting vCard? thanks. Yes, it would be great, but so far, it looks like this feature may be not required. Bug 823492 and bug 838121 are connected to this as well. A little late on the game (as the other was already resolved), but doesn't this bug collide with bug 920533 ? Supporting it on certain apps and not in other seems clumsy. Of course we 'can' do it, but 'should' we do that? The rule should be: permissive with what we receive, strict with what we send. Hi Omega, we will need your help to define how to deal with vCcard attachment. Basically it should open contact/new contact page when user click on the vCard, but a wireframe or protptype would be peceft for feature implemetation, thanks. Here is the UX spec. Let me know your feedback if any. Needs Francisco's feedback as well. A couple of things, in contacts we are able to read any vcard format from 2.0 to 4.0, but recently we downgraded our writter from 4.0 to 2.0, the reason was compatibility with android. Modern android devices were not able to read the vcards that we were generating with vcard format 4.0. Now we have a parser to create vcard in format 2.0 and apparently we get ride of the compatibility problems. Regarding the wireframes by Omega, in the contacts app we already have an activity to import vcards, since we had this use case when importing a vcard from bluetooth, but the way it works is different. You could see the experience in action if you send a contact from an android phone to a firefox os via bluetooth or just send a vcard with several contacts via bluetooth file transfer. In the case of a single contact, we open the list, import (you see a spinner for importing) and then move to the contact detail (with the contact already imported). In the case of several contacts, we open the list, import (see the spinner), and stay on the list. That was flow specified for the bluetooth transfer, IMHO, we should be consistent, either have the old experience or the new one. I think we can have a quick win by just using current code (activity and flow), and adding a better follow up, specially when haida is ready, will be easier, since we could point to specific parts of the app (like going directly to the contact form). Small correction: We downgraded the generation of vCard to 3.0, not 4.0. Given our target market, I think we should do both. BTW, Stock Android 4.3 does not support any of them; there are applications in the Play Store to support vCard as SMS, but I found nothing to support vCard as MMS. We can't even display the content! Don't know for Androd 4.4. David, I think you'll want to split the tasks in several subtasks (notably SMS and MMS-based vcards, sending and receiving). Please ping me if you have any question! After a talk with Francisco, we are going to proceed progressively. As a first step in bug 974589 we are going to implement an activity that will allow to list vCard content and import the content (all or nothing) if the user decides to do so. Later, we will consider contact selection, after we see how it works or if it is necessary. Hey josé, is this bug implemented as part of other bugs now? > Hey josé, is this bug implemented as part of other bugs now? Currently we are no actively working on it but the plan is to implement it in the near future as a new activity view in order not to pollute the current contact list selection UI. My colleague Adrian will work on it once he finishes some 2.2 blockers he is assigned to right now. Asking for feedback about the first iteration of this new feature. When opening a vCard with multiple contacts, it shows a list of all contacts included, with photos if contacts have it and it allows the user to import all contacts. Then it will check for duplicates and tell the user how many contacts were imported before closing the activity. PR updated with the changes suggested. New f?. If everything goes well, I'll just add tests and ask for review. All comments addressed once more! I added some tests this time, all of them passing and code working on device. I'll finish tests later today. Next stage would be r? Everything pointed out about unit tests has been fixed, and a Marionette test to check if all contacts are imported has been added as well. A/ Ask for a UI review to Fang. Show to her two different cases: When the contact has a photo and when not. Asking for review since everything has been fixed. r- as the flashing effect is still there. On the other hand the file name should not include the 'sms-attachments' string, as I guess this is an internal folder which does not provide any useful information to the user. I would suggest that in order to overcome the flashing issue, We just simply perform a transition for the import view from the bottom to the top, similar to the one we perform when there is only one contact. New ui-review because last one was not made properly. Transition from bottom to top when opening activity is working. There was a css conflict with a class that was overriding the correct transition property. With those transitions, be careful that we can't trigger some action twice by double tapping a button (tapping once will trigger the activity, but you can actually tap a second time because while the transition is happening the new panel is not hiding the action button. 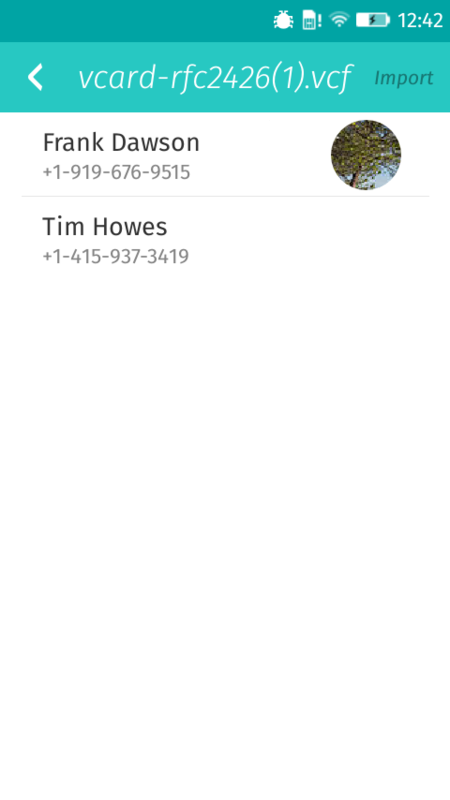 The transition is done once Contacts app is launched so buttons are immediately disabled. I tested this and I wasn't able to trigger the activity twice. very nice work. We are going to land this despite not having the UI review for Fang. Adrian, please open a follow-up for the visual tweaks of this new view. The ui review has been moved to a follow up (bug 1134995). Fang is out on Chinese New Year, like most of the rest of the Taipei office. I'm flagging Peter La to see if he can take this quick review for Fang during CNY. Adding Peter La on ui-review? in lieu of Fang during CNY. This is, however, landing anyway, but should have gotten review from Fang. > landing anyway, but should have gotten review from Fang. We landed the bug but we have open a follow-up for the visual tweaks (bug 1134995). I've replied the review on bug 1134995, Thanks! We are adding a lot of code changes here and would like to know what we are doing. Flagging myself to get that understanding.